As discussed in this blog a few weeks ago, Gerald Marks was a musical genius who applied his art to the service of a cause – his love Edna Berger, first of all, but also to Edna’s mission to give creative people in the news business a seat at the table to negotiate with the boss. 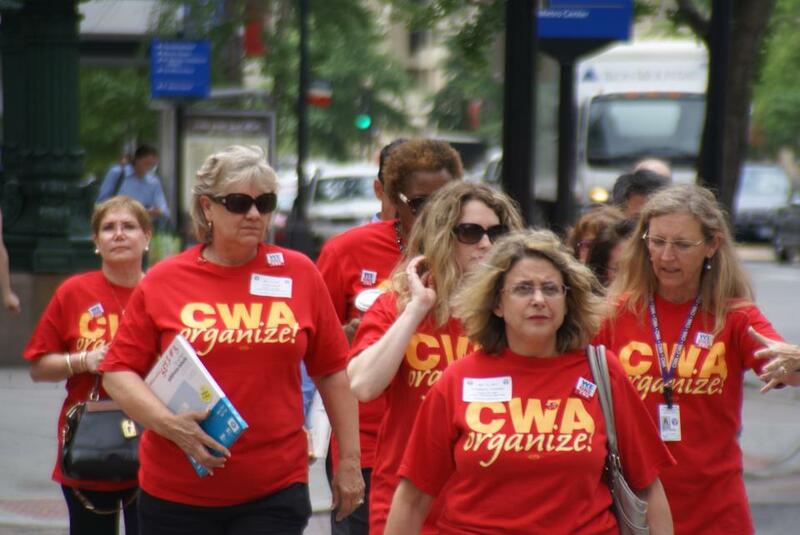 She was the first woman to lead The Newspaper Guild’s organizing, as the senior field representative. She was relentless, and he loved that about her. Gerald bequeathed much of his estate, literally “All of Me” and other pop royalties from Tin Pan Alley on, to broaden a scholarship fund for young women created by Edna’s close friends and acolytes, which has grown into the Berger-Marks Foundation. In November, the foundation awarded, in Edna’s name, cash grants to young women of distinction, who are leading the movement for social and economic justice. It was the second Edna award, and a credit to Gerald’s generosity and Edna’s passion. He put his money where his heart was, creating a fund to do good deeds, to help encourage a new generation of women who care about social justice, and to lead others to care. Like Veronica Avila, who won the 2012 Edna because of her work organizing restaurant workers in Chicago, helping them rise out of poverty. I was reminded of the power of music again this week on a couple of accounts, including the “Robin Hood” concert for Hurricane Sandy victims in New York City, an amazing outpouring of love and affection for a city and a region, including the Jersey Shore, that has nourished a generation of artists. 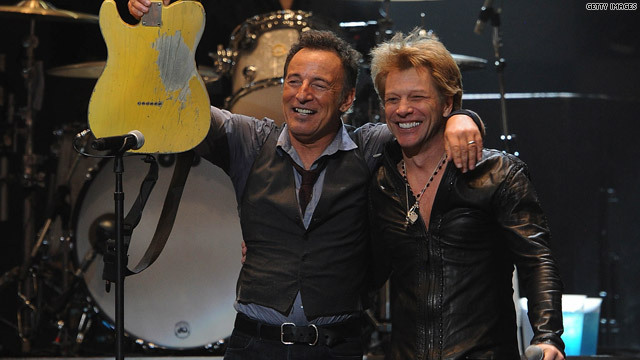 Bruce Springsteen and Jon BonJovi celebrate “La Causa,” to revive the Jersey Shore. Jersey boys Bruce Springsteen and Jon BonJovi kicked off the concert, followed by legend after legend: Billy Joel conjuring up the “New York State of Mind,” Roger Watters invoking Pink Floyd’s “Comfortably Numb” with Eddy Vedder, Paul McCartney reviving Nirvana, Alicia Keyes and Kanye West, Chris Martin of Coldplay backing up Michael Stitt of REM, the Who rocking the house, Daltry shirtless again, Mick Jagger and the Rolling Stones prancing around a “crossfire hurricane” like they weren’t really 69, going on 70. As someone said, it was like my iPod was playing the concert. Here were many of my favorite artists playing their hearts out, with this perpetual offer of the gift of music, this act of love for New Yorkers who are suffering. Here, take out music, please. Please donate. We’re giving our music back to you. From the sublime to the ridiculous: the other experience. I’m dealing with a corporation that controls the assets of the estate of a musical artist, and the agents of this corporation have made clear to me that generosity and love do not rule the music business, Gerald Marks notwithstanding. To have our music embrace you and your cause, you must deal with a breed of mendacious executors of musical legacy who insert their own values into the process. ABKCO kept the song bottled up for three decades in a legal fight with RCA Records, which also had a claim based on its earlier recordings. Even the producers of Malcolm X were prohibited from including the song on the 1992 movie sound track, although it still played during the movie. ABKCO is a musical publishing company founded by Allen Klein, the former manager of the Beatles and the Rolling Stones who proved to be a litigious suitor of their musical legacy. The company has demonstrated that it will go to court at the drop of a hat, and apparently there is no lack of hats at ABKCO. Thus, I should not have been surprised when ABKCO rejected our request to use “A Change is Gonna Come” as a rally point for agents at American Airlines, who finally have a chance to vote for representation by the Communications Workers of America after the company tied them up for nearly a year with administrative foot-dragging and a frivolous suit pushed all the way to the Supreme Court. Some people in this Internet age of “free stuff” would not ask, of course, but unions have always defended intellectual property – many great musicians, writers and dramatic artists have defended the rights to their work through their unions, from the American Federation of Musicians (AFM) to Actors Equity to the Screen Actors Guild to the American Guild of Musical Artists, and many others. The National Writers Union, and its formative president Jonathan Tasini, sued the New York Times to ensure that freelance writers were paid for their work that the Times posted on the Internet. Gerald Marks secured his legacy not only with his songbook, but also as a longtime board member for the American Society of Composers, Authors and Publishers (ASCAP), which licenses the use of music for members. I had hoped that I could go through ASCAP to inspire our agents with “A Change is Gonna Come,” but ABKCO has secured the rights through many years of litigation. I wonder what Sam Cooke would think about how a song he wrote to inspire – there were few such gospel-tinged songs in pop music when he wrote it in 1963 – has been bottled up by a publishing company whose main mission is apparently to keep a stable of lawyers in alligator shoes. I think Sam Cooke would have looked favorably on the struggle of American Airlines agents to gain a voice at work, at a time when they are being laid off and outsourced, and their jobs diminished by a company that is shredding their rights under cover of bankruptcy. But the number crunchers are in control, and “people of his own nature, and purpose” can be pushed aside. 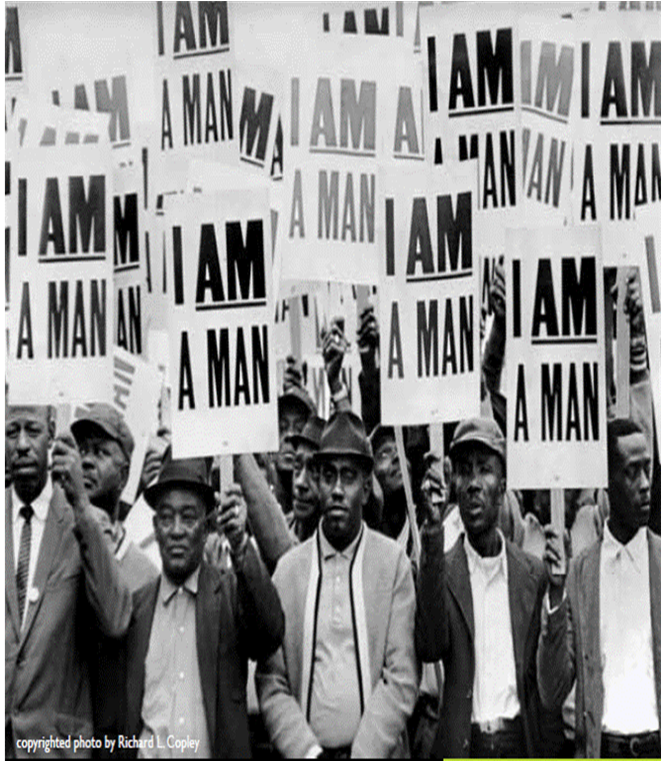 Reminder: Martin Luther King was in Memphis to support the right of sanitation workers to join a union when he was gunned down – surely the act that galvanized the civil rights movement and the sentiment expressed so well in Sam Cooke’s song. The right to be represented at work should be a basic civil right, as it is in many countries around the world. That’s an indictment of Klein and the class of entrepreneur who would exploit the power of music for personal gain. The Robin Hood concert for Hurricane Sandy victims confirms what we know is true in our hearts – music is for us all. What these artists give to us is really invaluable. It transcends the petty deal-making and profit-taking. Can we get an app for that?